WIKILEAKS REPRISED — A WHIFF OF…WHAT? From what the press is reporting about this Wikileaks “dump,” perhaps 10% are Secret or Confidential, the rest Unclassified, and nothing is Top Secret or above. I have followed the unfolding teapot-tempest drama of the latest Wikileaks release with a certain bemusement, accompanied by a growing suspicion shared with others that all is not as it seems with these supposed revelations. But my initial impression, based of course on what I am reading in the mainstream and alternative media and not in the cables themselves, is that it is surprising how little damaging material is there about much of the world. Secretary Clinton cannot be happy at having the UN people know what she told her people there to do, of course, and there is a great deal to whet assorted salacious appetites. More substantive issues will doubtless emerge, but I expect most if not all to be embarrassing rather than destructive. Perhaps the principal reason for this largely titillating, trivial aspect of so many of the released cables is the cables themselves. It is worth understanding that in the US government, even material that is taken from newspapers and clipped together can end up being classified “Secret” or “Confidential.” Really important or sensitive material (as in truly “national security” sensitive) is classified “Top Secret” or above. From what the press is reporting about this Wikileaks “dump,” perhaps 10% are Secret or Confidential, the rest Unclassified, and nothing is Top Secret or above. This reflects the VERY low-level diplomatic “gossip column” character of much of what has been released and discussed in the media so far. But I suspect the general reaction of politicians and diplomats everywhere, all of whom send the same type of cables about others, will be a blend of public umbrage and private amusement, coupled with overtures to Ukraine for nursing support. The one striking exception in all of this global tour de farce <sic.> is the Middle East. Certainly, even aside from Wikileaks founder Julian Assange’s fulsome praise of Binyamin Netanyahu, what is said and what is not represent the message Israel and its partisans in the US Government (itself heavily Zionist and “Israel First” in orientation) want the world to hear, believe and accept. The message coming across in the US diplomatic cables could have been designed and drafted by Avigdor Lieberman, and who knows? It may have been…. The overt theme in the Middle East cables consists of a blend of attacks on prominent political figures in Turkey and Iran, coupled with critical and disparaging commentaries about their actual or alleged policies and ambitions. One might think that the architects of the Ottoman and Persian Empires in their times of splendor were simultaneously on the move again, with everything between them (except poor, brave, steadfast and enduring Israel, of course) trembling in fear and awe. Complimenting this is a region-wide belief attributed to many Arab leaders of the need for stronger action, including military strikes, to thwart Iran’s regional and especially nuclear ambitions — precisely what Israel has been saying all along. Now, this may be true. I know, for example, that the Sunni leadership in many of those countries have their own concerns about Iran, just as Iran’s current leadership have with some of them. But at least two things cause me to question this supposed thesis. One is the odd attribution in at least one of the cables to an Arab leader of a remark on Iran being an “existential threat.” Yet no one except Israel and its proponents refer to any other country as an “existential threat” to anyone, suggesting quite clearly that either some of the released cables regarding Iran are forgeries, or they were deliberately cast in terms to create an impression that Arab leaders really want the US and/or Israel to attack Iran, true or not. Surely something so scathing would have been communicated back to Washington, alongside which Iran and its president would come off smelling like several bouquets of roses — slightly wilted roses, perhaps, but vastly better than the Israeli stinkpot. So these, at least, are probably the handiwork of Israeli-Americans or just Israelis putting their own spin on things, included in a mass of otherwise legitimate cables as camouflage and for validation. An Australian news website concluded that “[the] WikiLeaks cables [are] the 9/11 of world diplomacy.” Too, too true – same source, different vehicle and venue, all helping pave the road to yet another needless war in Israel’s service, this time against Iran. The gods weep — but not, presumably, Yahweh. December 7, 2010 Posted by aletho | Deception, Mainstream Media, Warmongering, Wars for Israel	| Comments Off on WIKILEAKS REPRISED — A WHIFF OF…WHAT? As a lame duck, Grayson, do you think you could just quack once for Corrie, Henochowicz and Dogan? Yesterday Mondoweiss posted about an appeal by Florida Congressman Alan Grayson at Huffpo to hear from the grassroots so as to reinvigorate the Democratic Party. Susie Kneedler sent Grayson, who was defeated last month, a letter. Thanks for asking for ideas. As a life-long liberal Democrat, I ask you to defend liberal values and at long last rescue the Democratic Party from its ridiculous enslavement to the extremist right-wing government of Israel and Prime Minister Binyamin Netanyahu. Otherwise, people of conscience will have no choice but to turn away from the “neo-conservative Dems” to form a truly progressive alternative, for propping up reactionary aims in one area perverts all. Two years ago, newly-elected President Barack Obama had a mandate to achieve an historic realignment of the United States against wars of aggression. Instead, he betrayed every campaign pledge by pursuing (neo-conservative, Pro-Israel) Bush-Cheney military and civic repression. Please support equal rights and equal self-determination for the people of Palestine and Israel. Please cease your inexplicable support for Israeli-government Apartheid in the Occupied Palestinian Territories and Israel. Please introduce a resolution to stop the U.S. government’s terrible donations of billions for illegal Israeli theft of Palestinian lands and water, as well as Obama’s unconscionable offer of $3 billion in new fighter aircraft, a gift that would enable an Israeli nuclear first-strike. Remember our U.S. Founders’ cry: “No taxation without representation!” Please work for “one person, one vote” in all Palestine and Israel, rather than the current system in which Palestinians pay taxes not only without representation, but without services, and–most cruelly–for their own imprisonment. Please stop catering to the Israel lobby’s fetish with making the world safe for Israeli expansion through its targeting of Iran, Syria, and Lebanon–after destroying Iraq. Iran, unlike Israel, has not attacked its neighbors–or the U.S. Israel, however, has done both. Meanwhile, the U.S. Congress has disgraced itself and violated its oath of office by refusing to probe Israeli-government assaults on American citizens: the U.S.S. Liberty, Rachel Corrie, Tristan Anderson, Furkan Dogan, and Emily Henochowicz–as well as on countless Palestinian civilians. Our representatives are obliged to defend our own people rather than the crimes of an alien nation. Rep. Grayson, while you remain in Congress–yet are free from the AIPAC puppeteers–you’re uniquely able to press for Congressional hearings on Israeli-government breaches of International Law, including the findings of the Goldstone Report about Israel’s bombardment of imprisoned Gaza. Please ensure that representatives of Israel register as a agents of a foreign government, as required by law. Please investigate the Israeli government’s repeated transgressions of the U.S. Arms Export Control Act. Please urge President Obama to push for Israeli compliance with International Law, rather than vetoing resolutions that properly condemn illegal Israeli aggression and human rights’ violations. Defend Americans by making friends with the world rather than siding with the Israeli war-machine. I tell you sadly, Rep. Grayson,–as a former admirer–that flattering yourself that you are a “person with a conscience,” while defending Israeli ethnic cleansing under a mendacious claim of “security,” is beyond hypocrisy. It is a lie. Please stand up for peace and peace of mind for all–not just for one religio-ethnic group of a foreign country. Please do your duty to defend the United States by loving all people in all places, including Palestine. Thank you. Oren is a tall, good looking man who radiated a quiet confidence. His book had the truly fanciful goal of showing that the intense American involvement in the Middle East and especially our engagement with the idea of a renewal of Jewish sovereignty in the region was not a recent development. Oren claimed that both the Zionist idea and the friction between Americans and Muslims is an important and persistent narrative thread running through American history from very early times. For instance, he describes the military confrontations of a young American republic with the Barbary pirates as the first battles in what we now call the “War on Terror.” My own conclusion after reading his book, was that Oren’s role as a conservative Israeli think-tanker had completely subsumed any desire he may have had to be an honest American historian. I assumed that he believed that this was a good career move for someone who simultaneously lived in Israel and taught at Yale University. At that point this apparently mild-mannered, obviously intelligent scholar seemed harmless enough. Of course, it was impossible to have known then that Oren would become Prime Minister Binyamin Netanyahu’s ambassador to the United States. – Ira Glunts first visited the Middle East in 1972, where he taught English and physical education in a small rural community in southern Israel. He was a volunteer in the Israeli Defense Forces in 1992. Mr. Glunts lives in Madison, New York where he operates a used and rare book business, writes and is a part-time reference librarian. Contact him at: gluntsi[at]morrisville[dot]edu. One type of “defensive” war is one that follows a successful provocation of aggression from the desired enemy. This method was used to begin, and repeatedly to escalate, the Vietnam War, as recorded in the Pentagon Papers. Setting aside the question of whether the United States should have entered World War II, in either Europe or the Pacific or both, the fact is that our country was unlikely to enter unless attacked. In 1928 the U.S. Senate had voted 85 to 1 to ratify the Kellogg-Briand Pact, a treaty that bound — and still binds — our nation and many others never again to engage in war. “At each session of Congress the question of further naval appropriations comes up. The swivel-chair admirals… don’t shout that ‘We need lots of battleships to war on this nation or that nation.’ Oh, no. First of all, they let it be known that America is menaced by a great naval power. Almost any day, these admirals will tell you, the great fleet of this supposed enemy will strike suddenly and annihilate our 125,000,000 people. Just like that. Then they begin to cry for a larger navy. For what? To fight the enemy? Oh my, no. Oh, no. For defense purposes only. Then, incidentally, they announce maneuvers in the Pacific. For defense. Uh, huh. The 1st American Volunteer Group (AVG) of the Chinese Air Force, also known as the Flying Tigers, moved ahead with recruitment and training immediately and first saw combat on December 20, 1941, twelve days (local time) after the Japanese attacked Pearl Harbor. Apparently nobody in Washington wanted to hear it in 1941 either. On November 15th, Army Chief of Staff George Marshall briefed the media on something we do not remember as “the Marshall Plan.” In fact we don’t remember it at all.” We are preparing an offensive war against Japan,” Marshall said, asking the journalists to keep it a secret, which as far as I know they dutifully did. Ten days later Secretary of War Henry Stimson wrote in his diary that he’d met in the Oval Office with Marshall, President Roosevelt, Secretary of the Navy Frank Knox, Admiral Harold Stark, and Secretary of State Cordell Hull. Roosevelt had told them the Japanese were likely to attack soon, possibly next Monday. That would have been December 1st, six days before the attack actually came. “The question,” Stimson wrote, ” was how we should maneuver them into the position of firing the first shot without allowing too much danger to ourselves. It was a difficult proposition.” Was it? One obvious answer was to keep the fleet in Pearl Harbor and keep the sailors stationed there in the dark while fretting about them from comfortable offices in Washington, D.C. In fact, that was the solution our suit-and-tied heroes went with. Whether or not World War II was the “good war” we are so often told it was, the idea that it was a defensive war because our innocent imperial outpost in the middle of the Pacific was attacked out of the clear blue sky is a myth that deserves to be buried. GAZA — Palestinian officials warned on Monday of complete stoppage of bakeries in the Gaza Strip by next week after wheat supplied through Israeli-controlled commercial crossings ran out of stock. Importers of wheat said that the wheat crisis was the result of the new Israeli procedure of cutting down the days during which wheat is allowed into the Strip. The Israeli occupation authority (IOA) had earlier decided to allow import of wheat and fodder for only two days out of three in which the Mintar crossing operate weekly with one day allocated for both commodities and the other for construction material for international agencies operating in Gaza. Abdul Nasser Al-Ajrami, the head of the society of bakers in Gaza, said that the new measure led to acute shortage in wheat and fodder that would exacerbate in the few coming days. 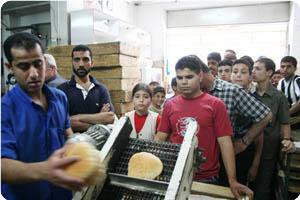 Ajrami told the German news agency (DPA) that the bakeries in the Strip have been facing shortage in wheat supplies. He underlined that Gaza needs 500 tons of wheat daily while the IOA allows entry of less than that quantity per week, which led to the gradual shortage. The IOA used to supply the Strip with 3200 tons of wheat weekly over two months ago but now it only allows 25% of the aforementioned amount. Dozens of top Israeli rabbis have signed on to a new ruling that would call on Jews not to rent homes to Arabs, Haaretz claimed. The religious ruling comes a few months after a call signed by a group of 18 prominent rabbis, including the chief rabbi of Safed, which urged Jews to not rent or sell property to non-Jews. Signatories of the ruling also appealed to the religious community to support Eliyahu, who could be tried for incitement against Arabs. Minority Affairs Minister, Avishay Braverman, has asked Justice Minister, Yaakov Neeman, to begin the process of suspending Rabbi Eliyahu immediately from his post of municipal rabbi, a position paid by public funds. “Moreover, as an appointee of the state, the rabbi is obligated not to work against it. His continued incitement against the Arabs in the Galilee does not serve the needs of the state,” Braverman stated. The rabbis’ call, initially published a few months ago and reprinted in October, demands Jewish property owners reconsider renting their apartments to Arabs believing that it would deflate the value of their houses as well as those in the neighborhood. “Their way of life is different than that of Jews…Among [the gentiles] are those who are bitter and hateful toward us and who meddle into our lives to the point where they are a danger.” the letter says. Considered one of Judaism’s four holy cities, Safed does not have a large Arab population.